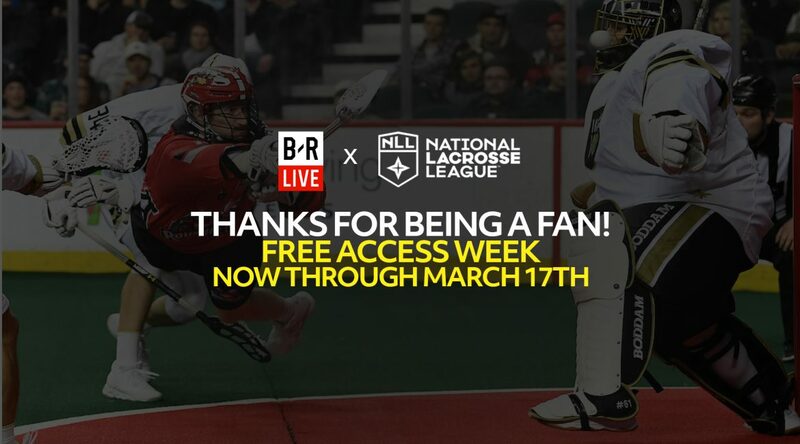 Philadelphia, March 14, 2019 – The National Lacrosse League (NLL), the largest men’s indoor professional league, has announced that all NLL content from now through March 17 will be free to view as part of B/R Live’s Free Access Week. Included is the March 15 game featuring Georgia at Rochester at 7:30 p.m. ET and the five games scheduled for March 16, starting with the 7:00 p.m. ET game between Rochester and Toronto. In addition, the March 12 episode of “Inside the NLL,” the league’s weekly show with game highlights, analysis and interviews from around the league with hosts Renee Washington and Devan Kaney will be free to view. As part of the promotion, current subscribers can enjoy full access to all NBA League Pass games from March 15 – 17 and the Alliance of American Football game on March 17 between the Memphis Express and the San Antonio Commanders. “As we inch closer to the conclusion of the regular season and the start of the playoffs, we’re happy to provide free content to lacrosse fans and introduce them to our league,” said NLL commissioner Nick Sakiewicz. “We’re looking forward to an exciting last eight weeks of the regular season and a compelling and entertaining playoffs.”In March of 2018, the NLL announced a three-year media partnership with Turner Sports and B/R Live to live-stream all NLL regular season and playoff games, highlights and original programming, deepening its commitment to elevating fan experience through digital programming. B/R Live is available by downloading the B/R Live app through iTunes or Google Play; and/or via Apple TV, the Roku platform and Amazon Fire TV.To get the most up to date information and breaking news, like this, sign up for the NLL newsletter at nll.com. The National Lacrosse League (NLL) is North America’s premier professional indoor lacrosse league. Founded in 1986, the NLL ranks third in average attendance for pro indoor sports worldwide, behind only the NHL and NBA. The League is comprised of 13 franchises across the United States and Canada: Buffalo Bandits, Calgary Roughnecks, Colorado Mammoth, Georgia Swarm, Halifax Thunderbirds, New England Black Wolves, New York Riptide, Philadelphia Wings, Rochester Knighthawks, San Diego Seals, Saskatchewan Rush, Toronto Rock, and Vancouver Warriors. For more information, visit NLL.com and find the NLL on Facebook, Instagram and Twitter.